If you’re anything like me, you’re excited about making the most of your days off. There are trails to hike, neighborhoods to explore, marathons to finish, restaurants to try…even a bit of shopping to do! Enter athleisure: because while I’m a huge fan of the comfort and support that nursing scrubs provide, I’m definitely not wearing them on my next trip to Yellowstone. Curious about what’s out there? I’ve got ya! Today, I’m reviewing an up-and-coming brand in the activewear and loungewear space, Outdoor Voices, to give you a sense of what you have to look forward to during your days off. 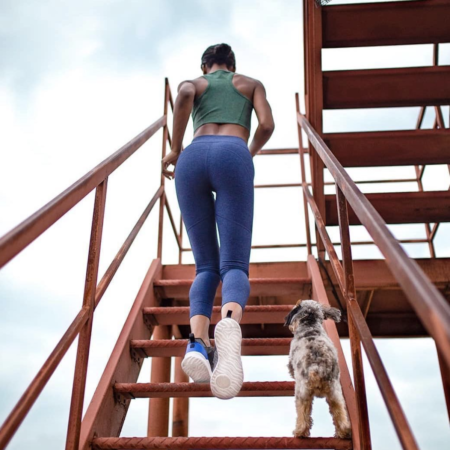 Beyond spawning colorful and comfortable workout sets, the brand is empowering communities (dogs included) to get outside and be active, or, as they call it, #Doingthings. Consistently high quality material. Outdoor Voices does tout “textured compression fabric”, and for good reason: their material is super comfy and thick, yet supportive. Very stylish leggings–and I mean very. Even if you don’t follow luxury apparel, chances are, you’ve probably seen OV’s iconic three tone chevron-striped leggings. Beyond their bold prints, they also experiment with fabric cuts (most, if not all of which are super-flattering) and heathered patterns. Wide range of colors and color combinations. Beyond just looking stylish, OV has a massive range of color options–from mature nudes/neutrals to bright pastels and even polka dots! Inclusive, body-positive marketing. I’m a big fan of diversity and inclusiveness in fitness. From their website to their social media presence, it’s clear that OV is committed to an inclusive fitness space. Fewer menswear options. Okay, to be fair, OV has really only recently gained enough steam to compete with the likes of Lululemon. I’m sure that given enough time, their menswear line will expand. But, in the meantime, guys do have far fewer clothing options, although I’m excited by what I see! Not the best option for all types of exercise. Some fitness aficionados swear by certain items (especially the leggings) for their workout needs, but I’ve found that there isn’t really a one-size-fits-all item. That is, there’s no one item that gets rave reviews across the board solely for exercising. If you engage in more than one type of exercise, you’ll probably need multiple options rather than a single go-to outfit. Sizing. Nailing sizing is always difficult, especially when catering to diverse body types. As a result, sizing across OV’s items isn’t super consistent. You should definitely try the clothes on in advance to make sure that they’re true-to-size. The good news is they keep it simple, they’ve got you covered XS to XL. You don’t mind dropping dough for fitness apparel investment pieces. If you’re used to the sticker shock of luxury brand fitness apparel (we’re talking Lululemon-esque), then Outdoor Voices’ prices may actually be a plus: their items are comparable and they offer styles and colors that Lululemon may not carry. You’re here for the “leisure” in “athleisure”. Hey, no shame! We’ve been there, too. These are perfect as loungewear for your days off, whether you’re grocery shopping, walking your dog, cleaning up around the house, or having yourself a chill day. Your workout routine mainly consists of one type of exercise. If this is the case, then you should at least quickly establish whether OV’s clothing line works for you (and find many options if it does!). The best part is that their quality is fairly consistent, so once you’ve tried a couple of items on, you should know what you’re in for. I’d definitely consider buying something at Outdoor Voices to be a splurge item, but you’ll be hard-pressed to find statement pieces that are that stylish, yet that comfortable. Their outfit sets scream Insta-ready…all that’s missing is your next destination. Do you have any Outdoor Voices apparel? We’d love to know what you think in the comments below!